Super easy brittle you can do in the microwave. Fun for kids to watch you make it…..kind of like a science experiment with the bubbles and color changes. This recipe cane be changed up to make it salty or spicy hot or even both, depending on your tastes for that day. Butter a cookie sheet all over the bottom. Then in a microwave proof clear bowl mix Karo and sugar together. On high heat zap for 4 minutes. This will be HOT SO BE CAREFUL. Remove from microwave add peanuts, stir. 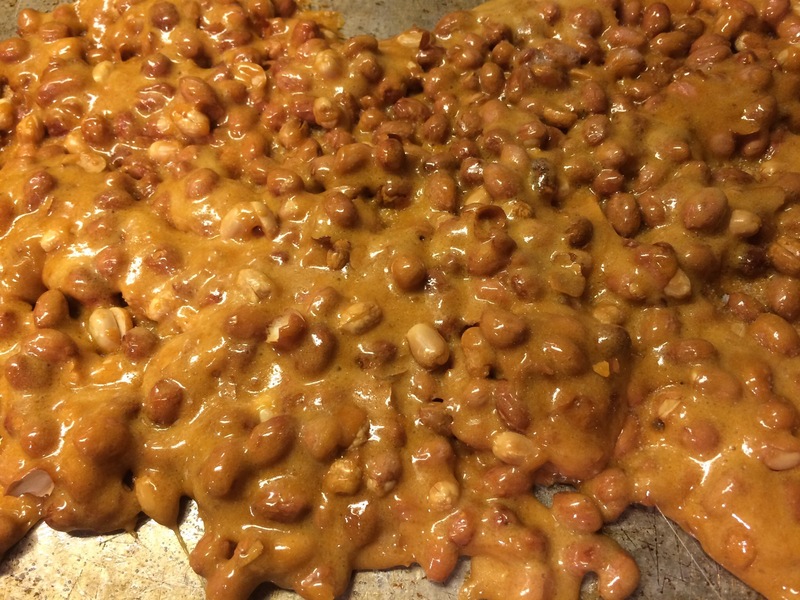 I sometimes add a half a cup more just because….place back in micro for 3 minutes, check to see if mixture just starts to turn color and/ or the peanuts have a strong peanut smell. DO NOT OVER COOK. You might need to do this twice. Remove……again it is hot. Stir in vanilla and butter. Back to microwave 1 minute. Remove and add baking soda, this is a fun part to watch….it gets foamy and changes color. This mixture is sticky and cools fast so mix quickly and pour a thin as possible onto buttered cookie sheet. If you need to thin it, use the back of a buttered spoon to move around, buttering it each time. Otherwise it will stick. Let cool. Break and eat! Sprinkle some sea salt on the buttered pan then again on top of the peanut brittle after pouring on cookie sheet. This give it a salty sweet crunchy goodness. Only on the top sprinkle ancho, red chile, cayenne, or any other dry hot spicy powder you like. You can even sprinkle roasted sesame seeds.